Passover is quickly upon us, and I’m excited to be hosting this year. With a challenge to make a spread of delicious Passover dishes for my guests, I push thoughts of serving crostini with prosciutto out of my head. Do you remember my run-in with Alan as I wrapped chicken in bacon for Rosh Hashanah? I know I can make him proud this year. Passover seders growing up were infrequent at best. It seemed we weren’t able to pull it together every year, but when we did my grandmother made a spread of all her finest fare. I can still picture my grandfather sitting at the table, in charge of the seder, yelling at my grandmother to sit down and promulgating assertively when it was time to drink the wine. I can recall at a very young age grandpa telling my mother it was fine for me to drink the wine, it would just make me sleepy. Was he trying to silence me? I certainly wasn’t missing any important Jewish lessons at our seder table, that’s for sure. He would usually lead the seder like this, “The Jews crossed the desert. Drink the wine. Forget it – let’s eat!” While other families spent hours going through the Haggadah, page by page, in painful detail, our seder was more like the abridged version of the cliff notes. In retrospect, I guess I shouldn’t be complaining but I know there’s a happy medium out there. I didn’t learn about the plagues until I bought my daughter a Rugrats Passover book when she was a toddler. Not normal! Come to think of it, this whole Passover experience might have been what led me to join our shul. The last Passover seder with my grandparents I can remember, I was in my twenties. In a rush to get through the one page of the Haggadah my grandfather would commit to reading, we jumped right into the pot roast and ate ourselves sick. While we sat drinking coffee and eating dessert, proudly rubbing our full bellies, my grandmother leaped up from her chair and announced that she had forgotten that there was a turkey in the oven! Really?! I guess we know now where I get my inability to make small quantities of food. We didn’t even miss that turkey. I guess we ate it for lunch the next day. We are a family of crazy foodies going back for generations. My father’s favorite food was anything with coconut. 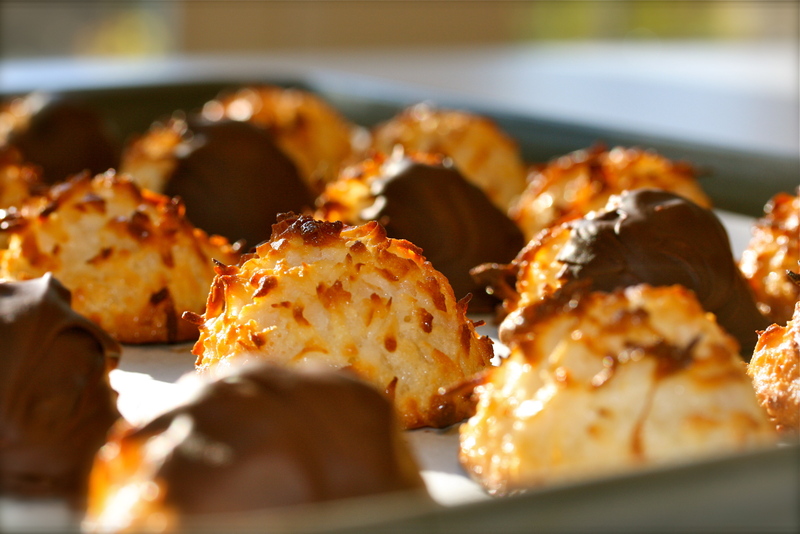 I discovered this recipe for coconut macaroons, originally adapted from the Barefoot Contessa and they are the perfect Passover treat. My dad would have loved them. Preheat the oven to 325 degrees. In the bowl of a stand mixer, whip the egg whites to beautiful peaks, not too stiff. In a second bowl, combine the coconut, condensed milk, vanilla and salt. Carefully fold the egg whites into the coconut mixture a little at a time, being careful not to overmix. Drop the batter onto parchment lined baking sheets using a cookie scoop. You want them to be fairly large, about a heaping tablespoon. The recipe should make about 25 cookies. Bake the cookies for about 18-20 minutes, switching the cookie sheets around halfway through. Bake until the cookies are nicely browned on the tops. Remove and cool on a rack. Meanwhile, to melt the chocolate, place the chips in a glass bowl and microwave for about 60 seconds. They won’t look melted, but give them a stir and put them back in, turning on the microwave for 30 second intervals, until the chocolate is just about melted. Stir again and it should be properly smooth and glossy. Watch it closely in the microwave. You don’t want it to heat up too much. Only until it is just coming together. Place a sheet of fresh parchment paper on a cookie sheet and dip one half of each cookie in the melted chocolate. Place the chocolate dipped cookies on the parchment and put the sheet pan in the refrigerator for about 30 minutes or until the chocolate is set. I usually make half of my macaroons chocolate dipped and leave the other half plain. So yummy! * Here’s the recipe for my grandmother’s pot roast if you are planning a holiday meal or just want to make something special for dinner tonight. 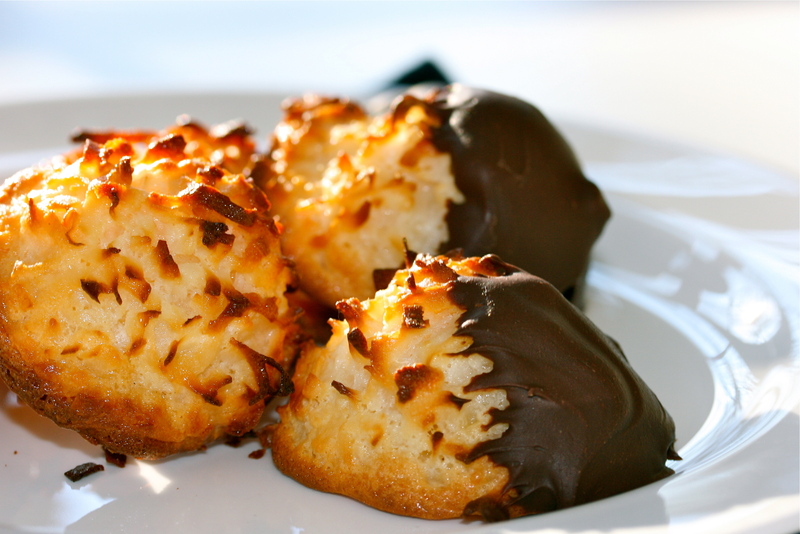 in my heart I know that if virtue is a cookie, this is it: chocolate dipped macaroons. Sweet fluffiness and sweet darkness paired in harmony. They are so beautiful – they must make incredible treats and perfect presents. Thanks so much! Definitely a sweet treat. great story, I like your grandpa! I made these on Saturday – they were delicious – I brought them to a party and everyone kept commenting on how good there were !! Thanks so much for letting me know. I’m so happy to hear you liked them!